The average life expectancy in the United States currently is about 79 . And, unsurprisingly, more than two-thirds of Americans say they’d like to live another 10 to 20 years longer . One possible route to a longer life is to cut calories drastically. Not much fun perhaps, but there’s evidence it works in yeast, worms, and mice—but probably not in monkeys . The potential life-extending strategy that I’d like to tell you about today focuses on the drug rapamycin, which blocks the activity of a protein called “target of rapamycin,” or TOR. Recently, a team here at NIH discovered that—at least in mice—reducing production of this protein through genetic engineering can add about 20% to the lifespan . Originally discovered in soil microbes on Easter Island , rapamycin is an antibiotic that is used as an antifungal and as an immune suppressant after organ transplants. Several years ago, researchers discovered that feeding rapamycin to middle-aged and older mice extended their lifespan compared to fellow mice that didn’t receive the drug . Rapamycin works by partially blocking the activity of TOR, which controls many functions in the cell. But there might be other unknown effects of the drug—so scientists began directly probing the role of the mammalian version of the protein, dubbed mTOR, to see whether reduced levels of mTOR would provide the same life extension benefit as rapamycin treatment. Previous work has shown that it’s a bad idea to get rid of the mTOR protein entirely—it’s vital for life . But the NIH researchers were curious about what would happen if they could reduce the quantity of this protein, starting when mice were still in the womb. When they modified the mTOR gene so it produced 75% less mTOR protein, the resulting mice lived about 20% longer than normal mice. This is actually a much more significant increase in lifespan than when normal adult mice are simply given rapamycin. And that’s not all. The low mTOR mice were more resistant to cancer than normal mice, and, as they aged, they retained their balance, coordination, and gait skills longer. As for cognition, the low mTOR mice performed better in mazes, suggesting they retained better spatial memory and cognitive skills as they aged. Unfortunately, the story wasn’t completely positive. The low mTOR mice had worse immune function than normal mice, leading to more infections—particularly of the mouth, eye, and skin. What’s more, they also showed greater bone loss and had an enhanced tendency toward cataract development. So, while reducing mTOR may lead to longer life overall, the findings underscore what scientists have long suspected: aging is a complex process controlled by more than one protein encoded by one gene. 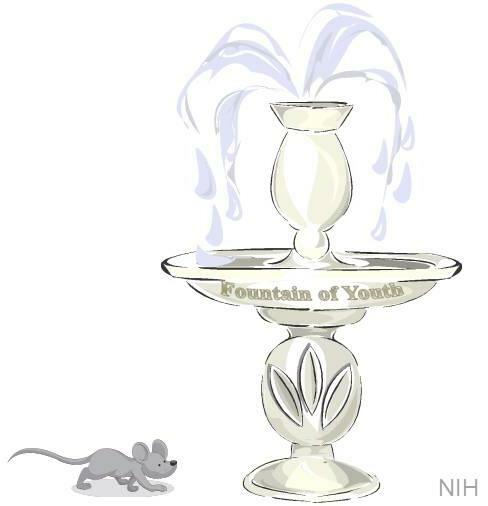 That means we still have a ways to go to discover the Fountain of Youth (if we ever do). However, if we identify the other genes involved and learn precisely how they accelerate or slow aging in various organs and tissues, it might someday be possible to tweak their activity and provide a couple more decades of healthy life. That might wreck the Social Security system, but most people would still be in favor! Impact of caloric restriction on health and survival in rhesus monkeys from the NIA study. Mattison JA, Roth GS, Beasley TM, Tilmont EM, Handy AM, Herbert RL, Longo DL, Allison DB, Young JE, Bryant M, Barnard D, Ward WF, Qi W, Ingram DK, de Cabo R. Nature. 2012 Sep 13;489(7415):318-21. Increased Mammalian Lifespan and a Segmental and Tissue-Specific Slowing of Aging after Genetic Reduction of mTOR Expression. Wu JJ, Liu J, Chen EB, Wang JJ, Cao L, Narayan N, Fergusson MM, Rovira II, Allen M, Springer DA, Lago CU, Zhang S, Dubois W, Ward T, Decabo R, Gavrilova O, Mock B, Finkel T. Cell Rep. 2013 Aug 28; S2211-1247(13)00392-6. Rapamycin (AY-22,989), a new antifungal antibiotic. I. Taxonomy of the producing streptomycete and isolation of the active principle. Vézina C, Kudelski A, Sehgal SN. J Antibiot (Tokyo). 1975 Oct; 28(10):721-6. Rapamycin fed late in life extends lifespan in genetically heterogeneous mice. Harrison DE, Strong R, Sharp ZD, Nelson JF, Astle CM, Flurkey K, Nadon NL, Wilkinson JE, Frenkel K, Carter CS, Pahor M, Javors MA, Fernandez E, Miller RA. Nature. 2009 Jul 16;460(7253):392-5.
 mTOR is essential for growth and proliferation in early mouse embryos and embryonic stem cells. Murakami M, Ichisaka T, Maeda M, Oshiro N, Hara K, Edenhofer F, Kiyama H, Yonezawa K, Yamanaka S. Mol Cell Biol. 2004 Aug;24(15):6710-8.